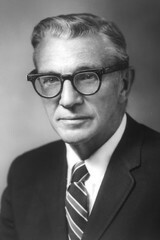 Gordon Zubrod, M.D., became head of the Division of Cancer Treatment of the National Cancer Institute in 1956 and scientific director in 1961. While at NCI, he helped develop new chemotherapy agents and promoted their use in clinical trials. He is credited with the introduction of the platinum-containing compounds (e.g. cisplatin).